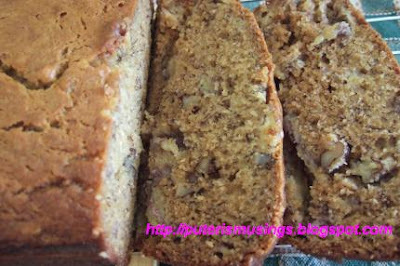 I just had to give Chef Gertrude's banana bread recipe a try after seeing Rita's version of the recipe. I had some over-ripe bananas so there was no reason not to give the recipe a try! The only problem with my attempt was that it was too moist. I knew when I put the bread mix into the baking pan that it could have done with just a little bit more flour. I used what was left of the flour that was in a bag, and it was just a tiny bit less than 1 1/2 cups. I had 2 other new bags of flour but just didn't want to bother with opening a new bag for just a tiny bit more. Arrggghhh. Puteri ... Yum! Your version looks like store-bought bread and I turned red after reading your post. I had mis-read Gert's recipe and actually used 1/2 cup flour instead of 1-1/2 cup!! No wonder the moisture. Talk about kitchen bloopers! Will have to try again. Thanks for the "tip". Haha. Haha, Rita, half cup of flour would most definitely make it very moist! Mine was a teeny bit less than 1-1/2 cups and it was more moist than I liked! I bought more bananas today and if they don't get eaten quickly enough I'll give the recipe another try.